Summary: When it comes to tracking your fitness activity, Fitbit is the name on everybody’s lips and looking at the Fitbit Blaze watch you can see why. This watch will monitor your sleep, your heart rate and your route while you’ll even be able to track a number of sports too. Sleek and stylish, this watch will keep you motivated and give your fitness levels a boost. I also recommend you check out the range of accessories. See the product page at amazon.co.uk for more. The Fitbit Blaze Watch is a physical activity tracker that you wear on your wrist, designed to keep you motivated whilst both improving and maintaining high fitness levels and a healthy lifestyle. 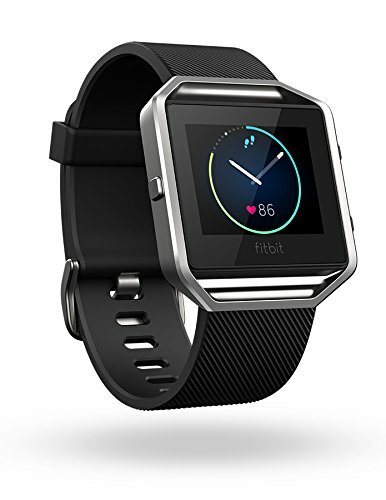 This mid-price range Fitbit watch is built to track your workouts, gauge your progress and monitor your overall performance, while the features such as Connected GPS, which can monitor your pace and map your route, take your fitness tracking to a whole new level. This watch will even track your sleep too. This revolutionary device includes PurePulse continuous heart rate and multi-sport modes which enhance every exercise, while you can also enjoy FitStar workouts. Multi-sport tracking allows you to track runs, cardio, cross-training, biking and more, while heart rate zones allow you check workout intensity quickly and easily. The watch has a high resolution colour touchscreen, which can be personalized, ensuring versatility and style. In comparison to similar pieces of equipment, this is at the higher price end, but you are certainly paying for quality here. The FitBit blaze will synch with over 200 devices, although unlike some of the similar lower cost items, much of your fitness information is right there in front of you on the watch display. Added extras such as music control and call, text and calendar alerts only enhance this premier Fitbit item. Reviews are somewhat limited, although the vast majority award the Fitbit Blaze either 4 or 5 stars. The device is said to look extremely smart and is ideal for those of you who do enjoy gadgets, whilst being light and comfortable to wear. The functionality is said to be ideal, while the Fitbit app alongside it is very easy to use. Small criticisms are the fact that charging can be a bit fiddly at times and syncing with some smart phones can take longer than expected. The FitBit Blaze Smart Fitness watch is ideal for those who want to track all of their fitness activity and keep their fitness motivation levels high, while wearing a piece of equipment that is lightweight and stylish too. The items synchs with your mobile device, keeps track of your routes, tracks your sleep and monitors your heart rate too.